We're back in Kyoto now. The 12 hours on the plane from San Francisco to Osaka went pretty well; Anthony was a good boy. Fumie presented him with some new toys to play with, and with them time went by quickly. A long-flight travel tip: I had ordered a special, low-cal meal for the flight. I need to watch my weight, but the real reason I did this is because (at least on United Airlines), ordering a special mean means that you get at the very start of meal service, well before others (up to half an hour before others, depending on where you're sitting). And at least on United Airlines, the specialty meals are very good. Anyway, getting one meal at first, then two later, is much easier than getting three at once. It leaves one adult meal-free to be with Anthony if he's attention-needy, allowing the other to eat. It also gives a wider variety of food from which to pick things for Anthony. Having arrived at 4PM local time (midnight California time), we stayed one night in the airport hotel, leaving the two-hour drive to Kyoto for after some sleep. The smoothness of our trip was broken a bit the next morning in the shuttle van when Anthony unexpectedly threw up, but luckily he seemed okay (perhaps just overly tired), and we were able to get things cleaned up fairly well. Arriving back at our place after two months away was a joy, especially because we were able to leave it clean. It's so nice to come home to a clean house. A day of sleep later and we're back on track. Our next step is to deal with all our luggage, and then I have something like 10,000 photos to process. 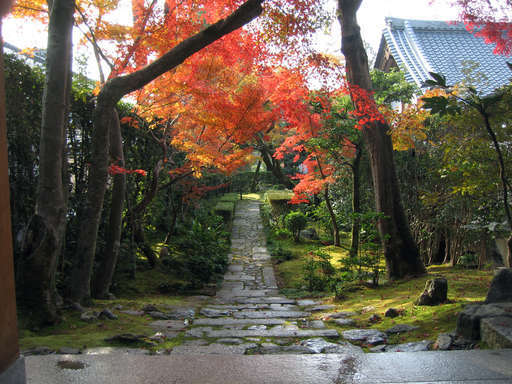 I'd better hurry, because Fall in Kyoto is glorious. Your pictures are absolutely beautiful. Thank you for sharing them. Welcome back! Really good timing, I think you got back just on the day when the temperature started to ease off. We are doing exactly the same with the meals in the plane as you do, but there is one more reason for us. On the way to Korea they serve a breakfast in the plane which is every time aweful. Just egg omelet. But the kids meal is pancake with different choices of jam and cereals. Much much more tasty. Even the dinner on the previous evening was nice: Pizza and spaghetti. Since that time we are all ordering the kids meal. Funny thing besides: The crew members are walking down the aisle with 4 kids meals, found our 2 kids, left 2 meals and went away. Walking up and down the aisle again and again searching for the other 2 kids (of course on their note was printed our seat :-), but not expecting that 2 adults have ordered kids meal.